Mastering the Art of 3D Animation With Blender! I’ll try to make this not sound too much like a match.com dating profile haha wink As you can tell I like humor and not taking life to seriously. That’s why Blender is so awesome as you can do whatever you want! I’m originally from France, came to the US when I was 5 years old and live in Los Angeles! I’ve always been an artist at heart (my whole family are artists as well for the most part) and would draw a lot while in school. My journey with 3D arts started when I came across a 2D stick figure animation software and created my first 2D animation…I was hooked! Then upon going to Barnes & Nobles, I came across a book on 3D animation… you guessed it! It was a Blender book. In it was a CD to download blender (which was missing because someone had stolen it) so I thought I couldn’t download it. Upon doing more research once I got home, I looked more into it and downloaded Blender. Let me ask, what was your first impression when you first opened up Blender? Do you remember? If I were to guess, might it be this face? surprised Well that was me haha. So there started the journey, like many of you on here, of learning this art of 3D. I learned from a lot of tutorials all over the place but I found that I learned and picked up things pretty fast as well. So by watching tutorials and messing around a LOT, I eventually got the hang of Blender. Wanting to sharing with as many people what I had learned, I started teaching it and found another thing I loved to do… teaching! 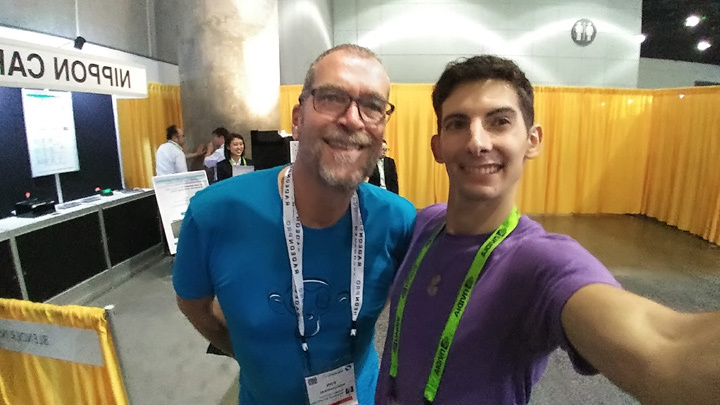 Ton Roosendaal (the creator of Blender) and I at Siggraph 2017!